Configuration: 12 packs per box. 32 cards per pack. 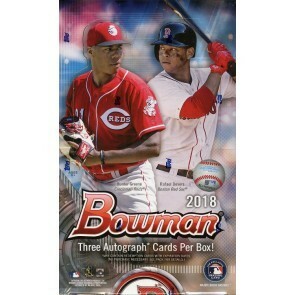 2018 Bowman Baseball will hit shelves in April 2018 AS The First Place to Find the Game's Future Stars. Continue to find MLB-licensed trading cards of the game's biggest prospects as well as 2018's most promising rookies. As with prior releases, 2018 Bowman will feature a colorful rainbow assortment of Base Cards and Top Prospects, as well as new insert subsets. The game's most promising prospects, including a fresh array of 1st Bowman subjects. Look for a new Sky Blue Paper Parallel as well as additional Chrome Refractor Parallels in 2018. Highlighting top prospects whose stocks have risen dramatically in the past season. The 2018 Bowman Baseball Jumbo Box will continue to deliver 3 autograph cards per box. Rare new autograph subsets have been added to this year's release which will showcase the game's biggest names and stars. Look for sequentially numbered, double-sided autograph cards featuring elite prospects. Showcasing today's top prospects from past high school All-America showcases. On-card autograph variations of the Sterling-branded continuity set.